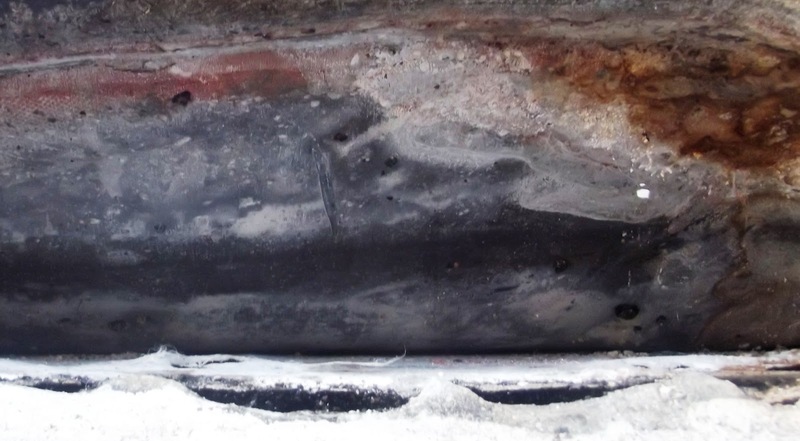 Lead Roof Corrosion - ArchiFACT Ltd.
A recent investigation revealed an oversight in roof design. The construction under investigation had wide lead gutters behind masonry parapets. These gutter formed part of the roof and are in effect cold decks over thick thermal insulation. Other parts of the roof were provided with interstitial ventilation following current guidance. The gutters were not. The natural durability of lead under normal conditions is due to the formation of protective insoluble salts which are formed on the surface. Moisture and carbon dioxide in the atmosphere combine to form weak carbonic acid and this reacts with bright metallic lead during periods of rain or overnight dews to form the normal grey patina typical of lead roofs. This thin continuous surface layer protects the metallic lead from further attack. On the underside of lead sheets these protective layers may not form. Most lead roofs are unaffected by underside corrosion or contain only a small amount of corrosion products, possibly as a result of damp conditions when the roof was laid. However, some roofs have been subject to severe underside corrosion as a result of on-going damp conditions, the presence of carboxylic (acetic and formic) acids given out by acid-containing substrates. The major corrosion product is the white hydrocerussite or white lead (2PbCO3.Pb(OH)2). However, in the presence of carboxylic acids, the red and yellow lead oxides of Massicot and Litharge may be formed. 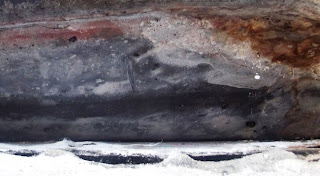 Underside corrosion of lead requires the presence of moisture and an absence of carbon dioxide. The accumulation of condensate which is depleted of carbon dioxide creates a risk of underside corrosion. When a thin film of moisture condenses on the underside surface, this becomes rich in oxygen and carbon dioxide. This forms the protective grey hydrocerussite patina, similar to that formed on the topside of lead by normal weathering. When thick films or droplets of condensation form on the underside surface, these are unable to absorb sufficient carbon dioxide to form a stable passive coating. Instead, the intermediate lead hydroxide forms on the metal surface and this migrates to the outside of the droplet where it eventually reacts with carbon dioxide to form the hydrocerussite. Because this has formed on the outside of the droplet (as compared to the metal surface) it is loose and non-protective and this allows further corrosion to occur during the next condensation period.